Meera - The SPICE Project, which stands for the Stratospheric Particle Injection for Climate Engineering, is being undertaken by the universities of Cambridge, Bristol and Oxford, looking into the technology of geo-engineering. This week, Dave and I have come along to the University of Cambridge Engineering Department to find out more of the engineering aspects of this project. One engineer on the SPICE project who's looking into getting this up into our stratosphere is Dr. Hugh Hunt. Now Hugh, first of all, how would you even go about designing this? Hugh - Well Meera, you might think, if you want to get some particles up there, you could say, take them up in aircrafts or you might send them up in balloons, but if you actually sit down and work out at the sums of what's possible, that narrows down the scope. 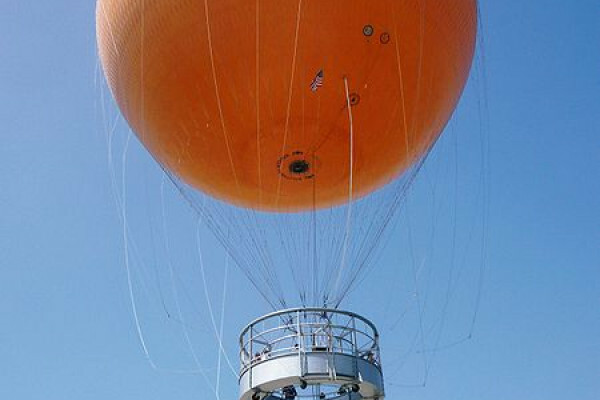 The technology that we're looking at is having a balloon right up in the stratosphere, 20 kilometres high. That's twice as high as a normal cruising commercial aircraft, holding a pipe like a big garden hose. Now this hose would be just like a garden hose, 20 kilometres long and we pump stuff up the pipe. The nice thing about it is that we can really have a knob, if you like, which we can control to adjust the rate at which we inject these particles. Hugh - In order to try and understand how a 20-kilometre tether works with the balloon up in the stratosphere, we really do need to make sure we understand smaller scale experiments. So this is great. We've got this chain, just an ordinary bathroom chain, and there's a balloon, you can see it up there. It's quite big, it's getting up to a meter in diameter. It sits up there a few meters up and you can see that if I just give it a whack on the side, the chain starts to wobble over the place, and the balloon starts to bounce up and down. This is going to be happening on a 20-kilometre scale and the tube has got to be able to take the pressure of 20 kilometres worth of weight of fluid. And reinforced garden hose, well we know what that looks like, but the most important thing to notice is that it's reinforced. So if we're going to have to hold back the thousands of atmospheres of pressure which we need to pump the stuff up this pipe, we're going to have to design the reinforcement really well. Dave - But weight is going to be a really big problem because the heavier the tube is, the bigger the balloon you need, and also, the more tension you've got in that tube. Hugh - Yes. So the whole weight of this thing is going to be a few hundred tons. That's the weight of several double-decker buses. So imagine how big a helium balloon do you need to hold several double-decker buses - a big balloon! We're looking at a balloon which is possibly 100 or 200 metres in diameter. It's about the same size as Wembley Stadium. Meera - That's an extremely large balloon. So, we've addressed the fact that you need to take the weight into consideration, the strength, but what about actually pumping things up to that height, and actually spraying it out into the stratosphere? Hugh - If we're pumping at several thousand atmospheres, and we're having to pump up an abrasive substance for instance, it's an engineering challenge. The pressures are high, the pump has to be designed to take those pressures. Then at the very top, we've got to disperse the material into the stratosphere through some kind of nozzle. If the nozzle would get blocked, it's not like an inkjet printer where you can just replace the cartridge. We won't be able to go up there to do anything. So we've got to make this thing work reliably for months, perhaps years at a time and we're pumping tens of thousands of kilograms of material everyday through this pipe. So, it's a big challenge. Meera - And what about actually launching the balloon up to such a height? Hugh - The real issues are that you've got your balloon folded up. So it's a bit like if you've got a sleeping bag in a sack and you're trying to get it out of the sack and you're trying to fill it up with helium or hydrogen, and get it launched, and take it up through the windy atmosphere and get it through whatever weather is going on, and get it up to this safe altitude of 20 kilometres, where in the stratosphere, the wind conditions are really much gentler. Dave - I guess also the temperature is changing a lot between the ground and the stratosphere as well. Hugh - Yeah, one thing we have to try and prevent happening is for any ice build up on the tether. Do we have to make sure the tether stays warm or do we have to put surface coatings on to make sure the ice doesn't form? Meera - And I guess one way to really see if it's possible is to do a trial. Hugh - Yeah, that's right and we've got plans in October/November this year to do a test at one kilometre. This is going to be quite a high profile exercise and before we can get permission for this trial we are undergoing a public engagement exercise, which is going on as we speak. Kirsty - To try and understand better some of the engineering challenges that are involved, we're planning to pump up water up this pipe at a rate similar to that you get with a garden hose. So, though the pressures aren't as high as they would be for the 20km system, it will still help us to understand what type of pump we should use and how well this water flows up the pipe, and whether it causes the balloon and the pipe to move anymore than the wind does. Dave - So you're doing this as an experiment essentially; So what do you not quite understand which you're hoping to learn by doing this? Kirsty - What we really want to understand better is how the tether moves in the wind. We know that if you have a helium balloon and you blow on it, it's going to sway from side to side. Now, is that an important issue when launching one of these balloons? Will we see as the balloon goes up to 1 km that the balloon sways from side to side and how much will it sway? We don't really know how to predict that. Meera - Now Hugh, this design is just one option in the approaches to climate change, but there must be other uses if you're able to get a balloon to that height as well. Hugh - I can imagine that things that satellites are used for presently maybe could be transferred to a tethered balloon; Communications, meteorological research, and so on. So once we crack the technology for a tether balloon at 20 kilometres, I can really imagine that there'll be lots of applications.